A porch is a good place in your house to enjoy outdoor weather or natural beauty, especially in the evening when all of your family members are back to home from the schools and offices. Whether it is open, screened or sunroom, a front porch needs to be decorated carefully. Decorating your front porch is also important because being the entry way, it is noticed first by your guests and passersby. Front porch is like a handshake place of your house that represents how you welcome your guests, neighbors and friends. There is a great need to create style, ease and comfort here and most of all it should maintain a spacious look to let you enjoy an open space. Making it too messy and covered, is no more going to create a difference from the rest of the closed areas of your house. However, if you have limited resources and space, the better decision is to hire a top interior designer in Pakistan, because he is who can design a perfect porch which you otherwise think is not possible to make. 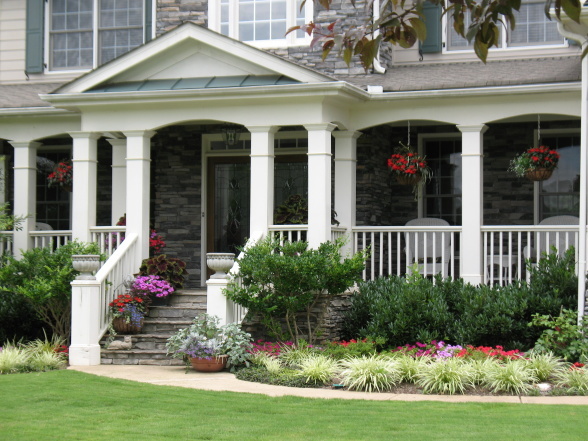 Here are some few simple tips using which you can get an ideal front-porch in your house. Whether your porch is smaller or larger, you need to add some greenery in it because this is perhaps the most essential thing to make it serve the real purpose of creating a feel of natural environment. If it is bigger one, you can have a garden with different floral plants. This will help you enjoy nature; moreover it will give a natural look to your house. If the front yard is smaller, then placing vertical plant holders with hanging flowers will give an enhanced look or you can also have vines like money plants and many others. You can even decorate the front door with hanging plants or creepers along all sides. The walking path can be of concrete as well as bricks – the choice is yours but the former is most appealing giving a posh look to your front yard. You can place the pebbles and floral plants alongside the pathways, enhancing its overall look. To spend time here, you need to have some furniture to sit. You do not need to go for the expensive furniture as you are having inside your house; rather the best way is to have bamboo or plastic furniture. For an elegant look, go for the bamboo furniture, including chairs table and even you can put a cradle here. Having proper lighting system in your front yard is also important because not only does it enhance porch look but also serves the purpose of making things and pathway viewable during night. You can place erected light or globe lights on the both sides of the gate, have proper lighting alongside the pathway running to front door. Sitting area should also be lighted well so that you can even enjoy a special supper time with Bar. B. Q meal. To get a best front yard designed in a reasonable budget, you can hire an interior designer in Lahore, as he can provide you with best ideas.